This guide describes how to sign up for an event using Occult Watcher. Our 5 December 2015 (UT) event involving Bienor will be used as an example. Click on the small upward arrow on the lower right corner of the task bar to show hidden icons. Select the Occult Watcher icon in the taskbar to open the program. If there is a message at the bottom of the OW window (possibly highlighted in black) indicating that there is a newer version of OW, click on this message to upgrade to this newer version. 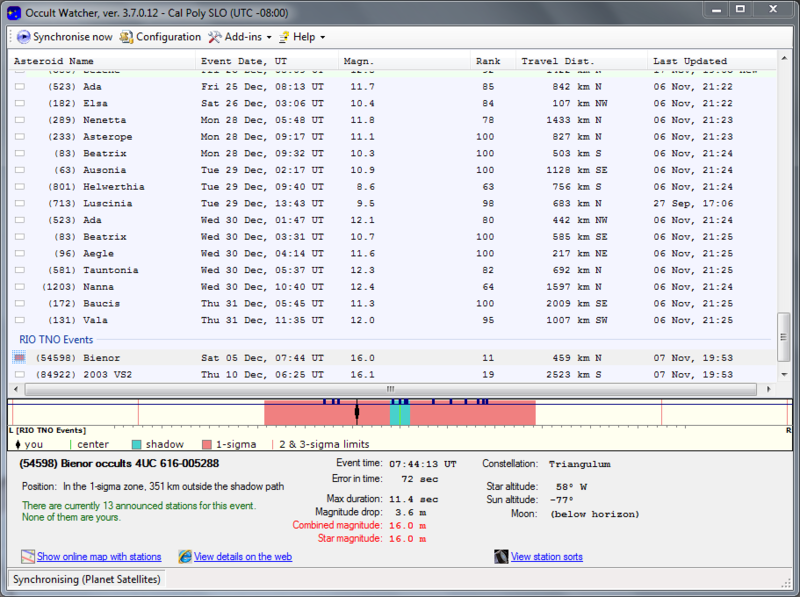 After you have confirmed that you are using the newest version of OW, select Configuration from the top menu bar. A window labeled Configuration should appear. 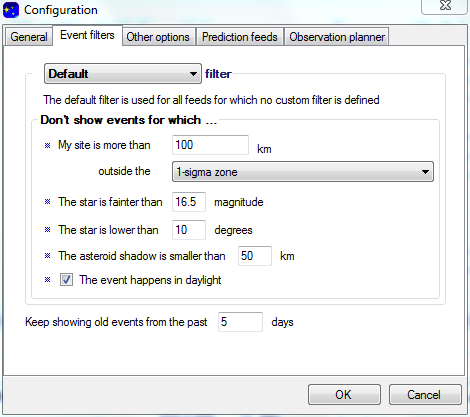 In this window, select the Prediction feeds tab to get to the display shown below. Scroll down to RIO TNO Events (Global) and confirm that this feed is checked. 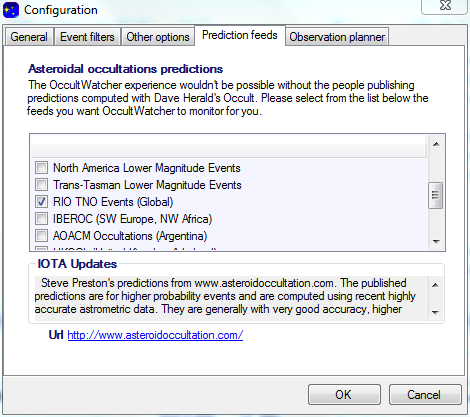 Selecting OK to leave the Configuration window and return to the main OccultWatcher window. 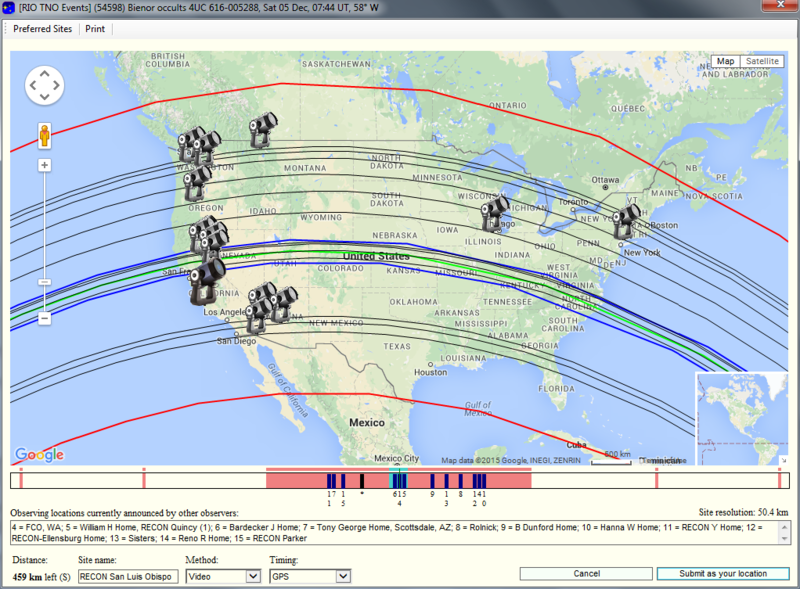 Notice the telescope icon representing your station; it is slightly larger and darker than the other icons. At the bottom right corner of the window, click the Enter station info button to sign up your station for the event. You should label your site name using the format RECON Location (in the example below, we have listed “RECON San Luis Obispo”). Make sure that you’ve also selected the Video method and GPS timing. Click Submit as your location to finish signing up. If you need to edit your station info after registering, simply reopen the map and click your telescope icon to show options to edit or delete your station. Beatty is signed up! — and we have OW working!!!!! How did that happen?